Yesterday’s signals were not triggered as the bullish price action took place just below 0.6802. Trades must be entered between 8am New York time Thursday and 5pm Tokyo time Friday. Go short following bearish price action on the H1 time frame immediately upon the next touch of 0.6871 or 0.6902. Long entry following bullish price action on the H1 time frame immediately upon the next touch of 0.6790 or 0.6708. I wrote yesterday that the odds would be with the bulls at a bottom just above 0.6800 and below that it would be likely to drift down to at least the 0.6750 area. I was wrong enough for this to hurt: there was a bottom, but it was just below 0.6800 and we have seen a bullish recovery from there. There is no direction here on any time frame except the shortest. This indicates that the best opportunities which could arise here in this pair are fast reversals on short time frames at the extremes of price at 0.6708 and 0.6902. 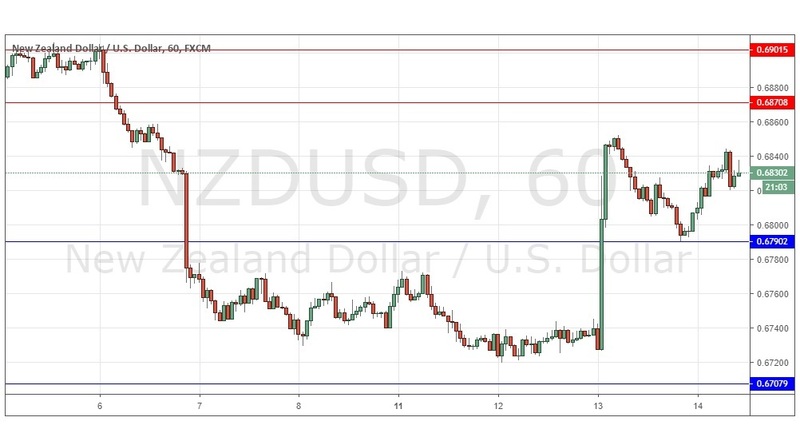 It is a very similar situation to the highly correlated AUD/USD currency pair.There is nothing of high importance due today regarding the NZD.